Having competent, committed, trustworthy and professional people on your sales team is crucial to your company’s success. The recently launched Spark Hire whitepaper, entitled “Growing Your Sales Team With Video Interviews”, highlights the value of using video interviews when hiring for a sales team. The paper discusses how employers and sales managers can save time during their hiring process and beat out their competitors to sales talent by utilizing video interviews. Furthermore, this allows them to grow their sales team faster. The sooner employers fill their sales team, the sooner they will be bringing in revenue to their company. Also highlighted in the paper is the ability to connect with passive job seekers by inviting them to participate in video interviews. It is usually very difficult to connect with passive job seekers since they may have a full-time work schedule that won’t allow them to actively look for a new job. However, it would be a mistake not to pursue these individuals because they are great candidates due to the fact that they are actively working and most likely keeping up with current industry trends. Video interviews can help employers so they won’t miss out on passive job seekers who could potentially be great additions to their sales team. Additionally, video interviews can help to increase efficiency in screening sales team candidates as detailed in the whitepaper. For example, ten one-way video interviews can be completed in the same amount of time it takes to complete one phone screen, which can allow for more people to be considered for the position. Moreover, the power of video interviewing can quickly deliver top quality sales team candidates that have the personality and confidence that employers are looking for and their communication skills can be asessed right from the get-go. The whitepaper also provides suggestions of interview questions that employers can ask sales team candidates to determine if they will be a good fit for the company. The questions focus on knowledge and career goals so as to better gauge the seriousness of a candidate in pursuing a sales career. 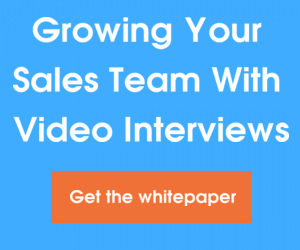 Download Spark Hire’s “Growing Your Sales Team With Video Interviews” whitepaper today!